The high performance dock bubbler deicer is capable of melting ice up to 50ft away in some of the coldest places on the planet! Besides being able to prevent ice damage to your dock or pier, this bubbler adds O2 to the water that helps prevent fish kills. Which Dock Bubbler Is Right For You? Depending on where you live and how you mount your bubbler, you may want to opt for a larger or smaller HP motor. 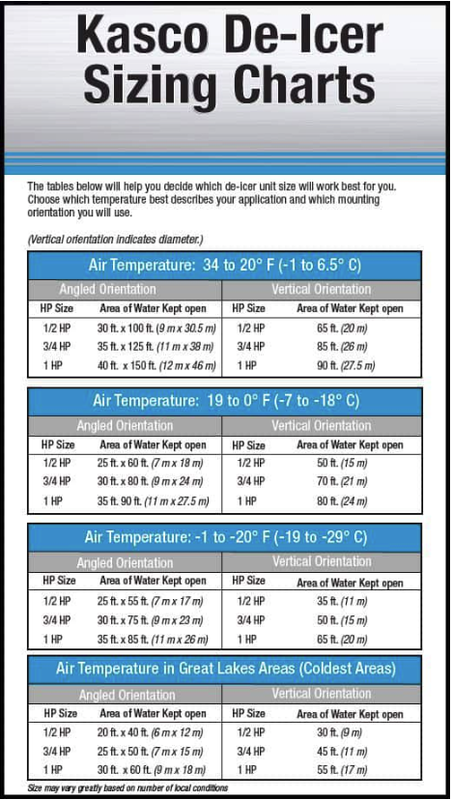 Below is a chart that shows the expected area of water that will be kept open around your dock based on average winter air temperatures. How Does The Dock Deicer Bubbler Work? A de-icer bubbler draws warmer, denser water from the bottom of your lake or pond and pushes it upwards to the surface. The warm water and circulation of the water is what prevents ice from forming around your dock, pier or anywhere else you place the bubbler. How Do I Install My Dock Bubbler System? There are a few different ways you can install your Kasco dock bubbler system. If you have a dock or pier, you can use the rope / sling mounted bubbler in the water by the edge of your dock. Or you can purchase the universal dock mount that attaches directly to your dock or pier. If you do not have a dock or pier, we offer a freestanding frame that can be placed anywhere in the water as well a bubbler float mount attachment. So you have decided to purchase your dock bubbler from the experts at Weeders Disgest! That is great news! Ties off nicely on dock cleats with the rope option. Pretty quiet for how large of an area it impacts. Overall good purchase.